I currently have a Luusmeitschi at home. When we visit my in-laws, Sam's sister calls her by this name, Luusmeitschi, but his mum often shakes her head and says, no she's a good little girl, not a naughty one. Grandmothers. Luusmeitschi, and Luusbub for boys, are just Swiss German's sweet ways of calling your little angel (or devil) a scallywag, scamp, rascal, rapscallion, imp or monkey. 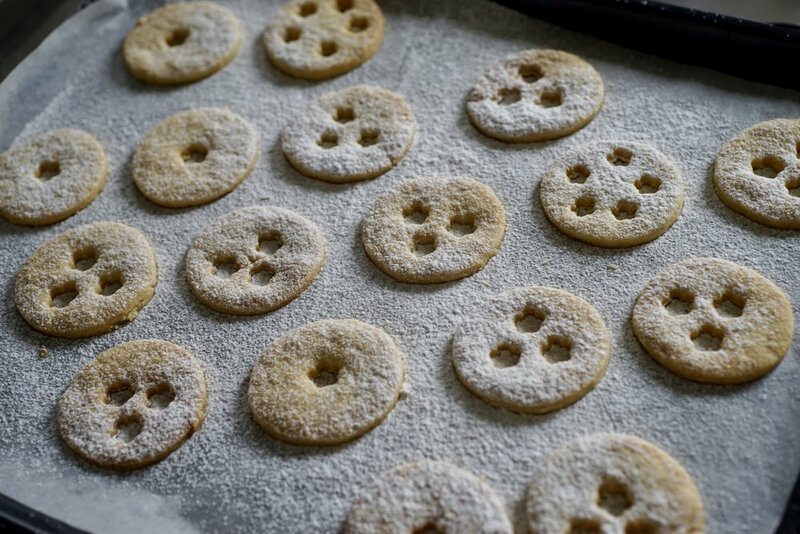 In high German a naughty boy is called a Spitzbub, which is also the name of a beloved and delicious jam sandwich cookie, often served around Christmas (my recipe here). The name of the cookies probably refers to the fact that jammy grinning faces were originally cut into the dough. But why should Spitzbuben have all the fun? Luckily Spitzbuben aren't filled with snips and snails and puppy dog tails, though these female equivalents do contain sugar and something nice—they are sandwiched with tart, creamy lemon curd. In a large bowl, mix together the flour, sugar, salt, and lemon zest. Add the cold butter in pieces and rub into the flour mixture with your fingers until it is sandy. Add the yolks and mix the dough until it comes together into a ball. Shape the dough into two discs, wrap with plastic, and let cool in the fridge for at least an hour. Preheat oven to 180° C / 350° F / gas mark 4. Roll out to about 3 mm (¼ inch) thick, then cut out with cookie cutters and place on a parchment-lined baking sheet. 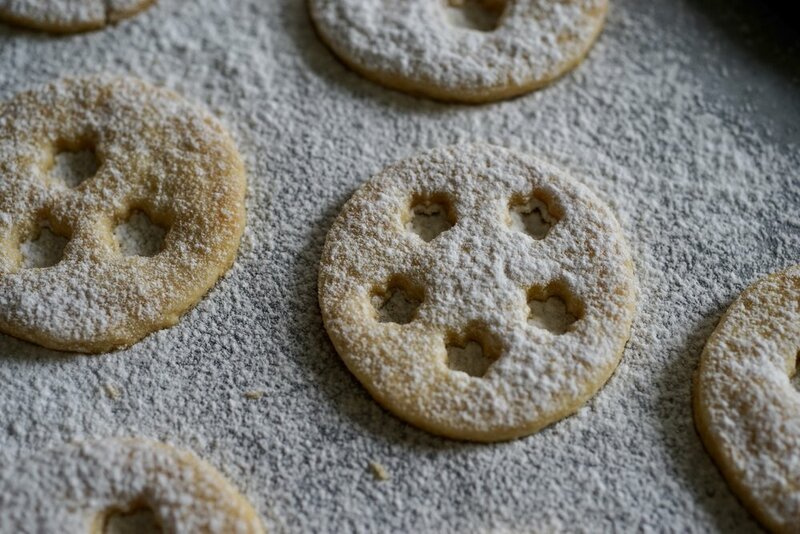 In half of the cookies, cut additional, smaller holes in the middle where the jelly will peek through. Separate the tops from the bottoms. Dust icing sugar over the tops. Smear a little curd on each bottom and gently press the two parts together. These are best eaten quickly, as the curd softens the cookie more than the jam does. They should be kept in the fridge, or better yet, the freezer. Of course you can also fill them with jam, or any number of other things—chocolate, caramel, the possibilities are endless. Put a large pot of water over medium heat. When the water starts to simmer, turn down the heat to medium low. Meanwhile, measure the sugar into a bowl that will fit on top of your pot without touching the water below (stainless steel works best). Add the lemon zest and rub it into the sugar with your fingers until it becomes fragrant and the sugar becomes slightly moist. Add the eggs and whisk well, then whisk in the lemon juice. Place the bowl top of the pot of simmering water. Whisk this frequently until the mixture thickens and resembles pudding. This can take up to half an hour depending on the heat of your water. Strain into a separate bowl and cover the surface directly with plastic wrap. Chill in the fridge for at least two hours before using. If you are feeling brave you can make the lemon curd over direct heat, no bain marie required. Use a low heat and whisk constantly so the egg does not curdle. If you only mildly curdle your curd (been there), you may be able to salvage things with a good strainer, especially since this curd is used as a filling.